Colour is an integral part of our lives and most certainly of home décor. No home décor is complete without a coat of fresh paint or furniture and upholstery that enhance living spaces. And, 2017 seems to be the year of the colour green! Green symbolises freshness or newness; it is the colour of ‘life’ that revitalises and represents growth and harmony. And, even more relevant to everyday human life is the fact that green also relaxes – it has a certain healing quality that is restful for the human eye. 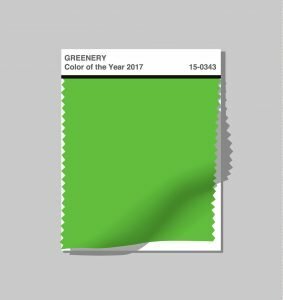 For a world that is engulfed in the drudgery of everyday life, The Pantone Color of the Year 2017 provides just the right kind of relief – Greenery! The Fresh and zesty yellow-green shade by the Pantone Color Institute is taking the design world by storm. According to Elle Décor, “This is the cherry shade of green you’ll see in home décor, fashion and commercial design in 2017”. As the Pantone Color Institute explains, “The more submerged people are in modern life, the greater their innate craving to immerse themselves in the physical beauty and inherent unity of the natural world. This shift is reflected by the proliferation of all things expressive of Greenery in daily lives through urban planning, architecture, lifestyle and design choices globally”. Matte is the New Black! Well, almost! According to designer Bobby Berk, matt forces the object to speak for itself. Over centuries, the kitchen has been considered to be the heart of the home. While kitchens in the modern age are getting smarter and sleeker, colour and finish seem to yet be an integral part of every kitchen. Black stainless-steel with a matt finish has been used in kitchen spaces for some years now, but recently this trend has caught on for appliances too. The new look for kitchens in 2017 is appliances in matt finishes. These provide greater warmth than plain stainless-steel ones and are certainly more elegant, even while they make cleaning easier and effectively mask finger prints. And, to match these appliances, faucets and counter tops too are being finished suitably. Marble has been used often by designers and home decorators since quite a few years. Marble has the genteel quality of lending a sense of sophistication to any living space. Pair it with brass, and you have refined minimalism. And, while marble was hugely popular in 2016, it seems the trend is here to stay in 2017. According to Young Huh, one of Vogue’s five young interior designers on the rise in 2015 believes that not just marble, but brass too will continue to dominate in 2017. According to Huh, this trend will be seen in bathrooms as well as kitchens, because as he explains, “It’s that combination of something very natural and clean, like white marble, and something industrial, hard, and a little bit glamorous with the brass”. Smart living is the new buzz words for 2017. Our lives revolve around devices 24×7, in the 21st century. Naturally, our homes too are now gradually being ’controlled’ by these smart devices. While complete home automation has not always been top priority for many home buyers, this is probably about to change in 2017. With companies such as IKEA designing furniture such as the Selje Nightstand that provides wireless charging for smart phones, smart technology seems to be becoming a way of everyday life for many. Smart phones can now also be used to monitor and control air conditioned temperatures indoors, open and close window blinds, secure the home with a single locking system at the touch of a screen and much more. If reports are to be believed, 80 million smart home devices were delivered worldwide in 2016 almost 64% more than in 2015. 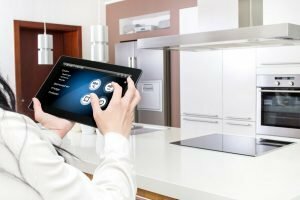 With companies such as Google, Bosch and Amazon unveiling personal (smart home) assistants in 2016, analysts believe 2017 will be the year of smart homes because these companies would only invest further in educating their consumers about their products. 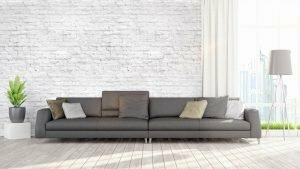 Texture is a trend that designers are trying to incorporate and make home decor not just aesthetic and appealing, but also pleasant to touch and look at. Textures can be brought about by adding various layers and surfaces in a room to make it more interesting. Textures make living spaces inviting and personal. They can be warm and fuzzy such as a rug thrown across the floor or a sofa with pleating and folds. The elements of nature too can be used to add texture – shells, stones, horns, feathers and more. Walls can be turned into the perfect canvas to play with texture. Asian Paints in fact offers a select range called Royale Play that allows you to create a multitude of effects and textures that are inspired various themes from around the world. At a macro level, textures provide a sense of comfort and familiarity, which is precisely the reason why designers are creating spaces that allow us to feel relaxed and unwind from the chaos around us.